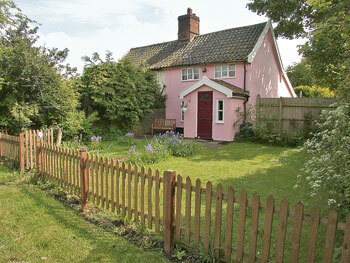 Chapter One is a little gem of a 17th century beamed cottage, set in the heart of a pretty Suffolk village. 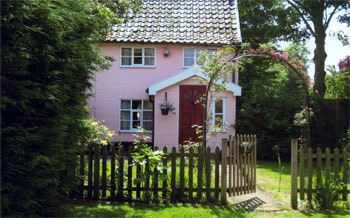 Adjoining another cottage, just 400 yards from a fine country inn, it lies 3 miles from the quaint market town of Framlingham's castle, and a working postmill. An antiques centre, plant nursery and golf are under 10 miles, and the Suffolk coast, RSPB Minsmere, Snape Maltings and Sutton Hoo (N.T.) are all within 18 miles. Shop 3 miles. Two bedrooms. Porch. Beamed sitting room with electric 'wood burning effect' stove. Pretty kitchen/dining room. Utility room. Bathroom/W.C. (shower over bath). Steep turning 'Suffolk cupboard' stairs to first floor: Double bedroom and twin bedded room both with beams and vaulted ceilings.